The Constitutional Law Unit in the Faculty of Law and Public Administration at Birzeit University, under the support and supervision of H.H. 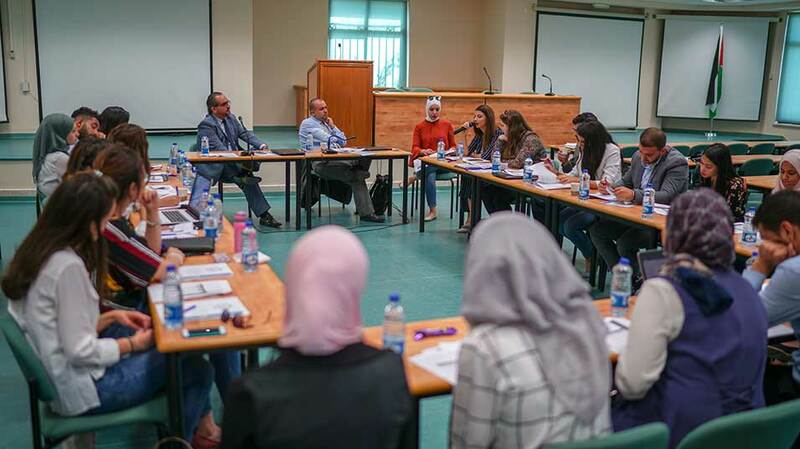 Shaikh Hamad Bin Khalifa Al-Thani Chair in Constitutional and International Law, has introduced its “Promising Researchers” Program in a recently-held session. Dr. Asem Khalil, unit supervisor and holder of the H.H. Shaikh Hamad Bin Khalifa Al-Thani Chair in Constitutional and International Law, welcomed attendees to the session and gave the floor to Dr. Rashad Twam, the Constitutional Law Unit coordinator, who gave a brief overview of the unit and the newly-inaugurated program. The Constitutional Law Unit, he said, was established in 2014 as the first academically-inclined research unit of its kind in Palestine. “The unit advances legal research and constitutional law scholarship, and provides internship and research opportunities for students,” he added. Twam presented the “Promising Researchers” Program, its aims, and entry requirements, and chaired the first plenary session of the meeting, in which the abstracts of eight research papers were examined. The topics of the papers were various: Human rights, by Newar Bdair, Saja Majdoubeh, and Mira Salhi; international humanitarian law, by Michelin Du’aik; international covenants, by Elias Elhihi; Palestinian nationality, by Nadia Abu Taha; state of emergency, by Newar Bdair; and constitutional systems, by Rashad Twam. The second plenary session saw attendees discuss relevant constitutional issues and nominate themselves for the program.